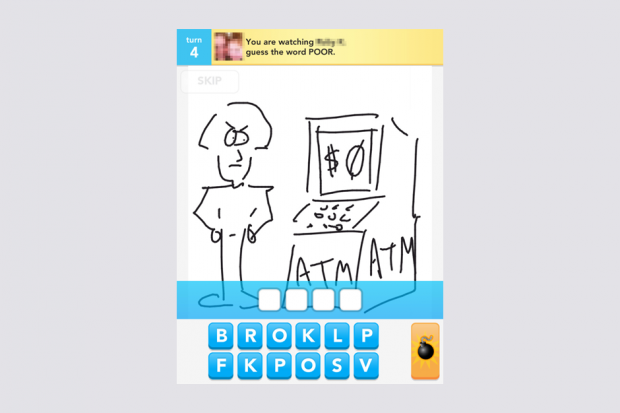 Whether you have a new third-generation iPad, or one of the previous models, there’s a good chance you’re already playing Draw Something, the out-of-left-field hit from OMGPOP. The game has been in the iTunes App Store Top 10 for weeks, and it’s essentially a take-off of Pictionary played from your mobile device, where you connect with friends in the game or through Facebook and take turns guessing the secret words behind each others’ drawings. It may not be the most original concept, but clever use of social media to share games between friends has made this a breakout hit, and a great example of an app being in the right place at the right time. Half of the fun is that it’s nearly impossible to draw even a straight line with your finger on an iPad screen, so the result is some hilariously bad art, even from those who fancy themselves decent notepad sketch artists. We’ve been trading pictures back and forth with friends for some time now, and here are a few of our favorites. Libe: Speaking of the ‘80s, all proms take place in that decade because I had a slight obsession with Pretty in Pink, and John Hughes movies in general. 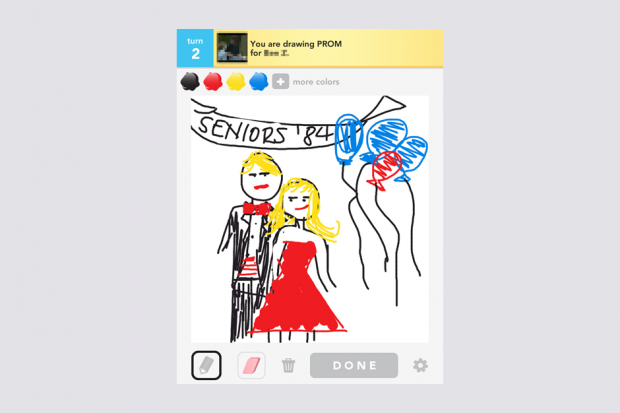 I don’t have pink as a color choice (I’m still trying to collect enough virtual coins to buy more colors in the game), so was forced to go with red as I attempted to recreate the magic of prom, complete with regrettable attire and the obligatory helium balloon bouquets. Put on some Psychedelic Furs and that pretty much sets the scene. Dan: This one threw me at first. With the clouds and wings, I thought maybe this was one of the horses that died while filming HBO’s recently cancelled Luck, up in horsie heaven. It also reminded me of the crayon drawings you always see in a movie when they’re trying to decide if little Jimmy should spend the rest of his life in a mental institution after hacking up his parents. One thing I didn’t think of at first was Pegasus, as that mythological creature is said to fly majestically through the sky, while this horse is just kinda standing in midair. Libe: OK, seriously? You said you liked this one, too. Were you trying to butter me up so you could buy the new iPad? 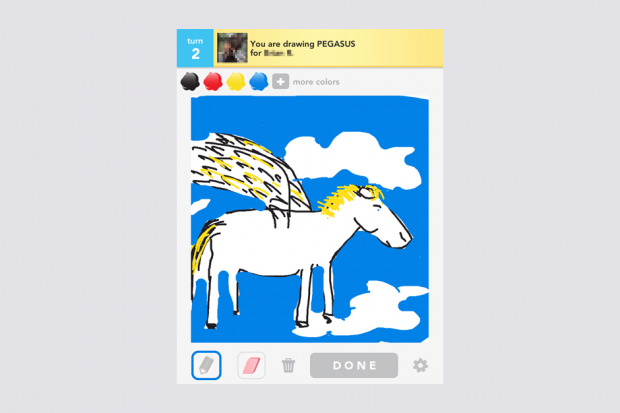 It’s clearly a horse, with wings, in the air, which equals Pegasus. You also guessed what it was pretty quickly, so mission accomplished. Dan: Now, I favor more of a clean black-and-white line drawing style, almost like an editorial cartoon. Illustrating a concept, like “poor,” can be harder than a person, place, or thing, so I tried to create a little scenario that would point you in the right direction, once you saw the number of letters in the word. Libe: My first guess for this one was “Broke,” mostly because the letters below seem to almost fit at first glance. Then I saw that it was a four-letter word, and eventually came up with “Poor.” Your cartooning skills are pretty decent, but a guy with his hands on his hips and a giant helmet coif doesn’t exactly convey poor. He looks more well-dressed and pissed off. This could double as a commentary on taxing the one-percent. I would have drawn a sad guy pulling his pockets inside out or wearing a barrel. 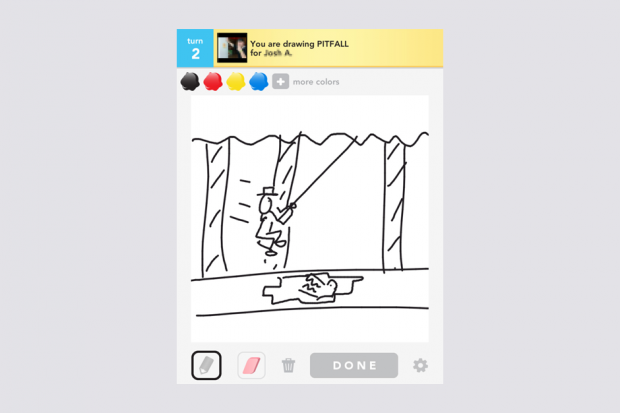 Dan: Another tough one, I thought about drawing a guy falling into a hole, or pit, in the ground, but that seemed too esoteric. Instead, I went with what’s hopefully a recognizable reference to the classic Atari video game, although I admit I looked up a screenshot on Google to remind myself of what the game looked like. Libe: I got this word the other day and drew something similar, but added color and a few more crocs for effect. It’s a bummer when you play so much that you start encountering the same words repeatedly. This also brings up the question: Should it be considered cheating to Google your word for drawing inspiration help? Draw Something is available for iOS and Android, currently on sale for $0.99.